For other uses, see Afterburner (disambiguation). An afterburner (or a reheat) is a component present on some jet engines, mostly those used on military supersonic aircraft. Its purpose is to provide an increase in thrust, usually for supersonic flight, takeoff, and combat situations. Afterburning is achieved by injecting additional fuel into the jet pipe downstream of (i.e., "after") the turbine. Afterburning significantly increases thrust without the weight of an additional engine, but at the cost of very high fuel consumption and decreased fuel efficiency, limiting its practical use to short bursts. Pilots can activate and deactivate afterburners in-flight, and jet engines are referred to as operating wet when afterburning is being used and dry when not. An engine producing maximum thrust wet is at maximum power, while an engine producing maximum thrust dry is at military power. Rear part of a sectioned Rolls-Royce Turbomeca Adour. The afterburner with its four combustion rings is clearly seen at the center. SR-71 Blackbird in flight with J58 engines on full afterburner, with numerous shock diamonds visible in the exhaust. Jet-engine thrust is governed by the general principle of mass flow rate. Thrust depends on two things: the velocity of the exhaust gas and the mass of that gas. A jet engine can produce more thrust by either accelerating the gas to a higher velocity or by having a greater mass of gas exit the engine. Designing a basic turbojet engine around the second principle produces the turbofan engine, which creates slower gas but more of it. Turbofans are highly fuel efficient and can deliver high thrust for long periods, but the design trade-off is a large size relative to the power output. Generating increased power with a more compact engine for short periods can be achieved using an afterburner. The afterburner increases thrust primarily by accelerating the exhaust gas to a higher velocity. The temperature of the gas in the engine is highest just before the turbine, and the ability for the turbine to withstand these temperatures is one of the primary restrictions on total dry engine thrust. This temperature is known as the Turbine Entry Temperature (TET), one of the critical engine operating parameters. Because a combustion rate high enough to consume all the intake oxygen would create temperatures high enough to overheat the turbine, the flow of fuel must be restricted to an extent that fuel rather than oxygen becomes the limiting factor in the reaction, leaving some oxygen to flow past the turbine. After passing the turbine, the gas expands at a near constant entropy, thus losing temperature. The afterburner then injects fuel downstream of the turbine and reheats the gas. As a result of the temperature rise in the tailpipe, the gas is ejected through the nozzle at a higher velocity. The mass flow is also slightly increased by the addition of the fuel. Afterburners produce markedly enhanced thrust as well as a visible flame at the back of the engine. This exhaust flame may show shock diamonds, which are caused by shock waves formed due to slight differences between ambient pressure and the exhaust pressure. These imbalances cause oscillations in the exhaust jet diameter over a short distance and cause visible banding where the pressure and temperature is highest. A similar type of thrust augmentation but using additional fuel burnt in a turbofan's cold bypass air only, instead of the combined cold and hot gas flows as in a conventional afterburning engine, is Plenum chamber burning (PCB), developed for the vectored thrust Bristol Siddeley BS100 engine for the Hawker Siddeley P.1154. In this engine, where the cold bypass and hot core turbine airflows are split between two sets of nozzles, front and rear, in the same manner as the Rolls-Royce Pegasus, additional fuel and afterburning was applied to the front cold air nozzles only. This technique was developed to give greater thrust for take-off and supersonic performance in an aircraft similar to, but of higher weight, than the Hawker Siddeley Harrier. Afterburners on a British Eurofighter Typhoon. A jet engine afterburner is an extended exhaust section containing extra fuel injectors. Since the jet engine upstream (i.e., before the turbine) will use little of the oxygen it ingests, additional fuel can be burned after the gas flow has left the turbines. When the afterburner is turned on, fuel is injected and igniters are fired. The resulting combustion process increases the afterburner exit (nozzle entry) temperature significantly, resulting in a steep increase in engine net thrust. In addition to the increase in afterburner exit stagnation temperature, there is also an increase in nozzle mass flow (i.e. afterburner entry mass flow plus the effective afterburner fuel flow), but a decrease in afterburner exit stagnation pressure (owing to a fundamental loss due to heating plus friction and turbulence losses). The resulting increase in afterburner exit volume flow is accommodated by increasing the throat area of the propulsion nozzle. Otherwise, the upstream turbomachinery rematches (probably causing a compressor stall or fan surge in a turbofan application). The first designs, e.g. Solar afterburners used on the F7U Cutlass, F-94 Starfire and F-89 Scorpion, had 2-position eyelid nozzles. Modern designs incorporate not only VG nozzles but multiple stages of augmentation via separate spray bars. To a first order, the gross thrust ratio (afterburning/dry) is directly proportional to the root of the stagnation temperature ratio across the afterburner (i.e. exit/entry). Due to their high fuel consumption, afterburners are usually used as little as possible. They are generally used only when it is important to have as much thrust as possible. This includes during takeoff from short runways, assisting catapult launches from aircraft carriers, and during air combat situations. A notable exception is the Pratt & Whitney J58 engine used in the SR-71 Blackbird. In heat engines such as jet engines, efficiency is best when combustion is done at the highest pressure and temperature possible, and expanded down to ambient pressure (see Carnot cycle). Since the exhaust gas already has reduced oxygen due to previous combustion, and since the fuel is not burning in a highly compressed air column, the afterburner is generally inefficient compared with the main combustor. Afterburner efficiency also declines significantly if, as is usually the case, the inlet and tailpipe pressure decreases with increasing altitude. This limitation only applies to turbojets. However, in a military turbofan combat engine the bypass air serves to cool the turbine blades and is added into the exhaust, hence, increasing the core and afterburner efficiency. For turbojets the gain is limited to 50%, while it depends on the bypass ratio in a turbofan and can be as much as 70%. However, as a counter-example, the SR-71 had reasonable efficiency at high altitude in afterburning mode ("wet") due to its high speed (mach 3.2) and hence high pressure due to ram intake. Afterburning has a significant influence upon engine cycle choice. 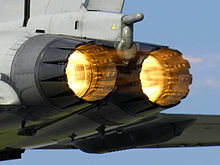 Lowering fan pressure ratio decreases specific thrust (both dry and wet afterburning), but results in a lower temperature entering the afterburner. Since the afterburning exit temperature is effectively fixed, the temperature rise across the unit increases, raising the afterburner fuel flow. The total fuel flow tends to increase faster than the net thrust, resulting in a higher specific fuel consumption (SFC). However, the corresponding dry power SFC improves (i.e. lower specific thrust). The high temperature ratio across the afterburner results in a good thrust boost. If the aircraft burns a large percentage of its fuel with the afterburner alight, it pays to select an engine cycle with a high specific thrust (i.e. high fan pressure ratio/low bypass ratio). The resulting engine is relatively fuel efficient with afterburning (i.e. Combat/Take-off), but thirsty in dry power. If, however, the afterburner is to be hardly used, a low specific thrust (low fan pressure ratio/high bypass ratio) cycle will be favored. Such an engine has a good dry SFC, but a poor afterburning SFC at Combat/Take-off. Often the engine designer is faced with a compromise between these two extremes. Early British reheat work included flight tests on a Rolls-Royce W2/B23 in a Gloster Meteor I in late 1944 and ground tests on a Power Jets W2/700 engine in mid-1945. This engine was destined for the Miles M.52 supersonic aircraft project. Early US research on the concept was done by NACA, in Cleveland, OH, leading to the publication of the paper "Theoretical Investigation of Thrust Augmentation of Turbojet Engines by Tail-pipe Burning" in January 1947. US work on afterburners in 1948 resulted in Solar installations on early straight-wing jets such as the Pirate, Starfire and Scorpion. The new Pratt & Whitney J48 turbojet, at 8,000 lbf (36 kN) thrust with afterburner, would power the Grumman sweptwing fighter F9F-6, which was about to go into production. Other new Navy fighters with afterburners included the Chance Vought F7U-3 Cutlass, powered by two 6,000 lbf (27 kN) thrust Westinghouse J46 engines. In the 1950s several large reheated engines were developed such as the Orenda Iroquois, and the British de Havilland Gyron and Rolls-Royce Avon RB.146 variants. The Rolls-Royce Avon RB.146 variants powered the English Electric Lightning, the first supersonic aircraft in RAF service. The Bristol-Siddeley Rolls-Royce Olympus was fitted with reheat for the TSR-2. This system was designed and developed jointly by Bristol Siddeley and Solar of San Diego. The reheat system for the Concorde was developed by Snecma. 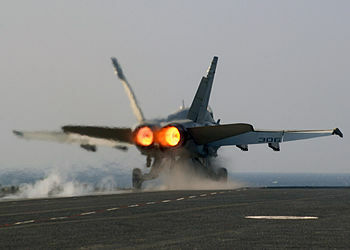 Afterburners are generally only used in military aircraft, and are considered standard equipment on fighter aircraft. The handful of civilian planes that have used them include some NASA research aircraft, the Tupolev Tu-144, Concorde and the White Knight of Scaled Composites. Concorde flew long distances at supersonic speeds. Sustained high speeds would be impossible with the high fuel consumption of reheat, and used afterburners at takeoff and to minimise time spent in the high drag transonic flight regime. Supersonic flight without afterburners is referred to as supercruise. A turbojet engine equipped with an afterburner is called an "afterburning turbojet", whereas a turbofan engine similarly equipped is sometimes called an "augmented turbofan". A "dump-and-burn" is a fuel dumping procedure where dumped fuel is intentionally ignited using the plane's afterburner. A spectacular flame combined with high speed makes this a popular display for airshows, or as a finale to fireworks. Fuel dumping is primarily used to reduce the mass of an aircraft to avoid a heavy / high speed landing; thus other than for safety or emergency reasons, the dump and burn procedure does not have a practical use. ^ Ronald D. Flack (2005). Fundamentals of jet propulsion with applications. Cambridge, UK: Cambridge University Press. ISBN 0-521-81983-0. ^ Graham, Richard H. (July 15, 2008). Flying the SR-71 Blackbird: In the Cockpit on a Secret Operational Mission. MBI Publishing Company. p. 56. ISBN 9781610600705. ^ "General Thrust Equation". www.grc.nasa.gov. Retrieved 19 March 2018. ^ Lloyd Dingle; Michael H Tooley (23 September 2013). Aircraft Engineering Principles. Routledge. pp. 189–. ISBN 978-1-136-07278-9. ^ Otis E. Lancaster (8 December 2015). Jet Propulsion Engines. Princeton University Press. pp. 176–. ISBN 978-1-4008-7791-1. ^ Zellman Warhaft (1997). An Introduction to Thermal-Fluid Engineering: The Engine and the Atmosphere. Cambridge University Press. pp. 97–. ISBN 978-0-521-58927-7. ^ "1962 | 2469 | Flight Archive". Flightglobal.com. Retrieved 2018-11-09. ^ SAE 871354 "The First U.S. Afterburner Development"
^ Bohanon, H R. "Theoretical investigation of thrust augmentation of turbojet engines by tail-pipe burning" (PDF). ntrs.nasa.gov. Wikimedia Commons has media related to Afterburners.